The official blog of the 2010 edition of Thin Air, Winnipeg International Writers' Festival, taking place Sept. 19-26. It's sort of a tradition for me to shoot the hands of the Bliss Carman winner. Apparently, it's also a tradition for me to shoot a blurry picture of the Bliss Carman winner. Sigh...it didn't help that Nora was standing in the doorway of the hospitality suite, on her way out, and kept on saying in her oh-so-wry way, "Are you done yet? Are you done?" But the moment I want to leave you with is this: in the green room before the Poetry Bash, Nora re-braided her long hair. And so I idly watched her hands comb through all that hair, as she un-made and then re-made a knot of her hair. Nora Gould has studied at Sage Hill, St Peter’s, Banff Wired Writing and Piper’s Frith in Newfoundland, and her poetry has appeared in echolocation, The Society, cv2, and The Prairie Journal. She is the 2010 recipient of the Bliss Carman Poetry Award, one of the prizes supported by the annual Prairie Fire Press-McNally Robinson Booksellers Writing Contests. 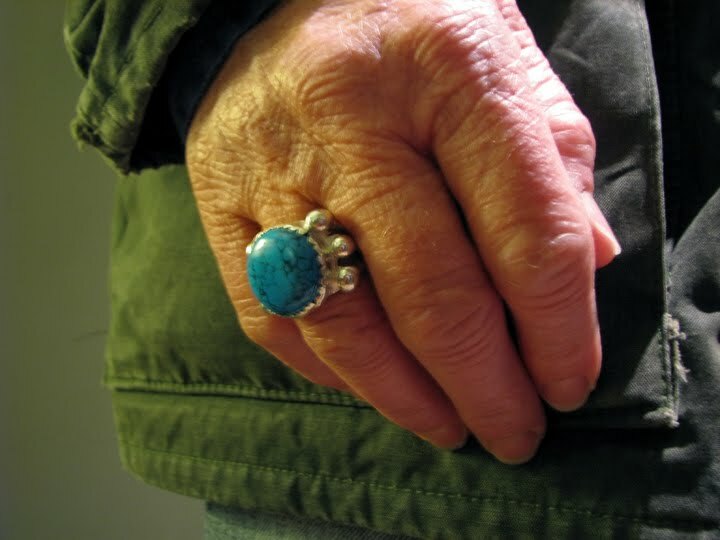 Her winning poem, “Some nights he breathed up all the air,” appears in the summer issue of Prairie Fire, and she will be presented with a replica of Bliss Carman’s ring at the Poetry Bash! Gould writes from a ranch near Consort, Alberta, and volunteers in wildlife rehabilitation with Medicine River.